If you’re in China, for instance, you’re probably using the leading Chinese search engine Baidu or the most popular messaging platform Q Q. Or you’re likely to be shopping. The increasingly powerful role of e-commerce in China is reflected in the popularity of Taobao and Tmall (Taobao Mall), both retail sites. They have so many users, in fact, that Taobao also appears in the global top 10 – in 10th place. 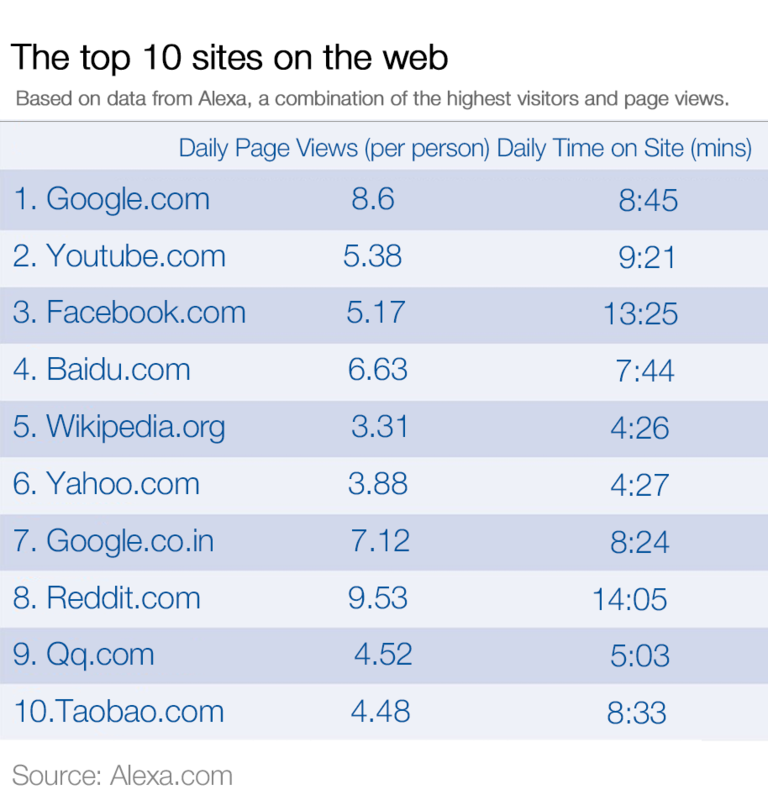 The internet is heavily policed in China, so it’s no surprise that most of the top sites are Chinese. While Google does appear at number 10, it’s a version most in the West wouldn’t recognize. In the Balkans it’s GazetaExpress, an online media portal. GazetaExpress is not just a news site for locals though, it’s also a trusted source for world media, according to Alexa. It is often referenced as a source of information in reports by the New York Times, Time, the Economist, Associated Press and Reuters . Some countries, such as China, have their own search engine that makes the top of their list. Vietnam's browser, Coc Coc, was set up by a “ bunch of geeks ”, who say that searching in the Vietnamese language requires a particular kind of search engine. They want to “win over internet users”, and it appears they already have – it’s the country’s top performer.